A Guide to Price Your Creative Work! Pricing is the area I hear Creatives struggling with most, and certainly something I struggled with myself when starting out. (You can read my full story here.) 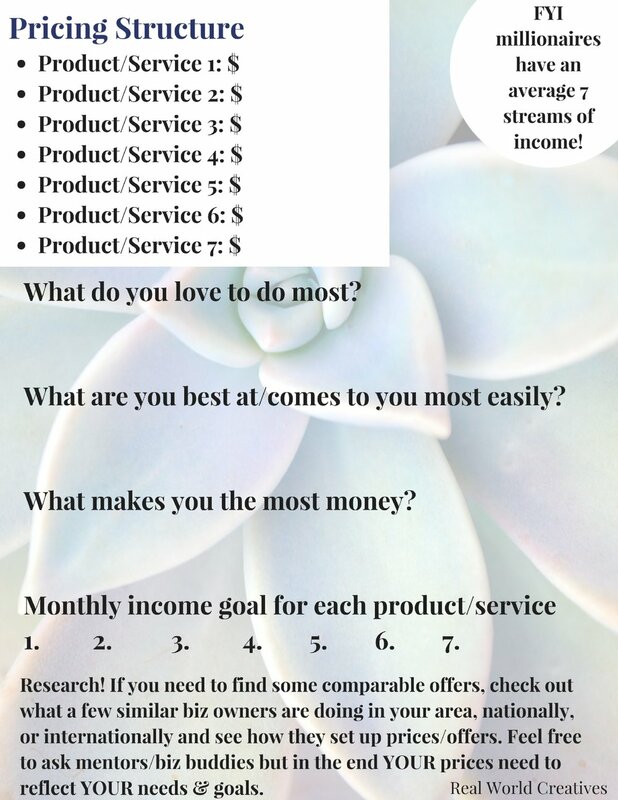 Below is my guide that I encourage people to use as an outline for setting up your pricing structures. Everyone's business is a little different, but the question you need to keep asking yourself is "Is this price realistic for MY needs?" If you're pricing according to what you think is "reasonable" for others, you will most likely stay broke or plateau with your income. Do your research for your industry if there are standard pricing practices, but know YOU are the expert of your own business and get to make the final call! The mindset portion is VERY important as well. Often times we know exactly what we need to charge- we just can't seem to stop discounting or giving things away! And that's where mindset plays a role. Don't ignore the questions even if they take some time to work through. It's all part of the puzzle leading to your unique, successful business! If you find yourself getting stuck or confused with any of this (totally normal) please go here to contact me so we can work through it together. Looking for a community of soulful women on the same journey as you? Head to our free Facebook group and get cozy!